The Internationalist makes art of incomprehension. Jay Yamada Alexandra Creighton and Nick Sholley are well-cast. Lowell cuts a striking figure, and not just because he's an American on a business trip in Europe. The protagonist of Anne Washburn's illuminating 2004 play The Internationalist, he could easily be summed up in one word: rumpled. Shirt never tucked in, tie perennially askew, a weird pouchiness that prevents his otherwise perfect features from being, well, classically handsome. He's slovenly with language, too. "Oh, this is great. I feel just a little like a mogul," he says to Sara, the cute secretary who picks him up at the airport — and whom he immediately mistakes for a lackey. Their exchange in the first scene of the play reveals all you need to know about Lowell, impulses and insecurities included. It's less illustrative of Sara's character, but that doesn't matter so much. In the world of the play she's more of a cipher, serving both to challenge Lowell's perceptions and to articulate her own culture's views of Americans. 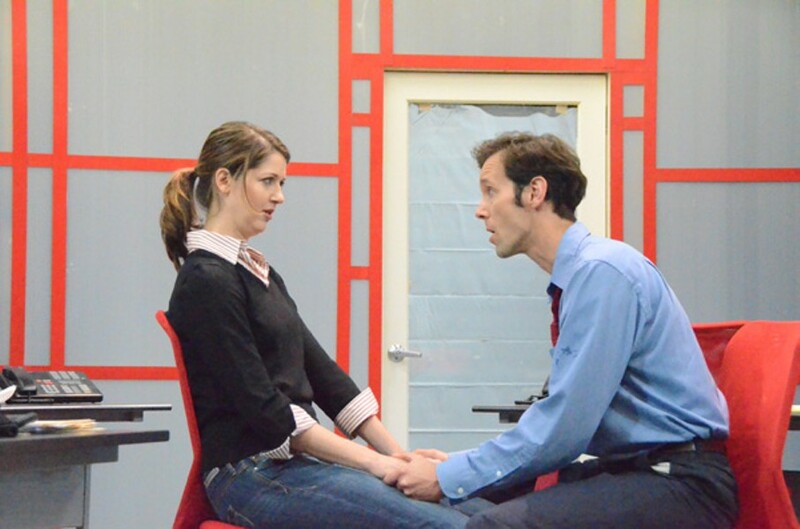 Granted, their first scene would not be quite as provocative were it not for the deftness and subtlety of actors Nick Sholley (playing Lowell) and Alexandra Creighton (as Sara). They are challenged with turning mutual suspicion into sexual tension, and also hinting at some larger sort of cultural dynamic that neither character could adequately comprehend. The first give-away is Lowell's attempt to tip Sara, because he thinks she's a chauffeur — she interprets the gesture as a proposition. There's a too-long pause, and a moment when she briefly narrows her eyes, followed by loud, agonized laughter. Creighton plays it perfectly: She's beautiful, trim, high-heeled, pencil-skirted, and poised, the way Washburn describes Sara in the stage directions. But she also regards Lowell with an air of sharp, barely concealed antipathy. Each pleasantry is actually a challenge; each flirtation a provocation. Their first scene is a long and winding dialogue that culminates in Lowell's hotel room; it's not so much a love scene as a careful pas de deaux. Just Theater's artistic director Jonathan Spector helmed this production, and he's apparently had a long and fruitful working relationship with Washburn, having also staged her 2007 production I Have Loved Strangers. It's easy to see what Spector loves about Washburn, a Berkeley-born dramatist who has gained national fame in the last decade. Her language isn't dense, but it's certainly intelligent, and she engages characters in hard theoretical discussions. "Kansas is your Jesus," Sara tells Lowell at a bar, trying to explain a "foreigner's" conception of America. Timed right, the line should always get a huge guffaw. It also speaks volumes. Spector evidently knows that the best way to honor a good script is to make very precise casting decisions — either that or he just lucked out with the talent pool that was available for this Internationalist. Sholley manages to be kind, self-important, tousled, charmingly sheepish, and weirdly dishonest, in the way that liberal Americans probably are when they travel abroad. He turns every social interaction into a bad first date. His foreign colleagues Irene (Lauren Bloom), James (Kalli Jonsson), and Nicol (Harold Pierce) form a perfect Greek chorus, marveling at the Lowell-Sara love connection while snidely putting both the American and the secretary in their rightful places. Michael Barrett Austin plays the eccentric, malevolent boss who, we can safely assume, gives shape to Lowell's worst fears about "the Other." The fact that Barrett Austin is a cute boy-next-door type only adds to the humor. What's best about this play, though, is that Washburn began with a concept (liberal Americans show a strange lack of humility when traveling overseas) and sought to develop it in a way that wouldn't estrange her audience. That's a tall order, particularly since the concept has a moralizing element to it. She handled it cleverly by setting the whole story in a made-up Western European country (I originally thought it was Germany) and making the characters slip into their own made-up language as a way of code-switching. Washburn saw to it that no subtitles be deployed, in order to clarify t-wo points: 1) Incomprehension is frustrating; and 2) When we don't understand something, we foist our own narrative upon it. Set designer Jenn Scheller and costume designer Christine Crook conspired to make an oppressive visual aesthetic, dominated by red-gray grids that match the colors of the characters' clothing — Lowell is the only one who deigns to wear blue. There's only one part when The Internationalist starts to moralize, right after Lowell rebuffs Sara in the second act. But even that becomes a complicated power exchange. Indeed, things are never quite as they seem in Washburn's play about foreign-ness and incomprehensibility. She lards the script with symbolism, yet it's never too obvious.